2014 seems like it was so long ago. It's been two years since then, when Joseph Michael Linsner scripted a crossover event giving the spotlight to both Dawn and Vampirella. Two years is a long time for those two characters to not be in the spotlight together which is why Dynamite Entertainment is giving them top-billing yet again in a new deluxe hardcover. This deluxe hardcover features an all-new introduction and never-before-seen bonus material by Linsner, as well as all six of the artist's breathtaking covers, plus an afterword by Kristina Deak-Linsner. It also features 144 pages of whimsical art and story by Linsner and will be priced at $24.99 when it hits stores in June. "Vampirella is comic book royalty, right up there with Wonder Woman, Sue Storm, and Red Sonja," says Linsner. "She is an icon; there is only one Vampi. In many ways, she is the original independent 'Bad Girl.' She started in black and white, and so did Dawn. It is an extreme honor to have Dawn share the stage with Vampirella in her very first crossover." When the silver-tongued demon Masodik kidnaps these beautiful, powerful women, he demands that the two engage in a catfight to prove which is best suited as his new paramour. The ladies suggest to combat in a more sophisticated and feminine way: by engaging in a storytelling contest. Together, Dawn and Vampirella take us on a journey to the bloody shores of Drakulon, post-apocalyptic New York, and worlds beyond imagination. Ultimately, they know that they must join forces to overcome him... but what common ground can be found between goddess and vampire? 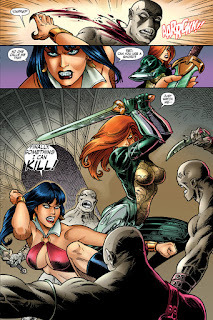 "Joe Linsner wove an incredible tapestry with Dawn and Vampirella, and beautifully illustrated the series. When we discussed collecting the series, we knew we had to up our game and give it the deluxe treatment to help match the incredible story and art," says Dynamite CEO/Publisher Nick Barrucci. "The crossover with Dawn and Vampirella was a once-in-a-lifetime event, and now fans can have this masterfully rendered story on their bookshelves." Crossover Event Featuring Two Female Comics Icons Gets an All-New Collection! April 8, 2016, Mt. Laurel, NJ: In 2014, the acclaimed Joseph Michael Linsner scripted a crossover event sharing the spotlight between his beloved creator-owned heroine Dawn and Dynamite Entertainment's horror icon, Vampirella. Joseph Michael Linsner, the celebrated creator of Dawn, wrote and illustrated the first-ever crossover event for his beloved goddess, teaming her -- and pitting her against -- Vampirella! When the silver-tongued demon Masodik kidnaps these beautiful, powerful women, he demands that the two engage in a catfight to prove which is best suited as his new paramour. The ladies suggest to combat in a more sophisticated and feminine way: by engaging in a storytelling contest. Together, Dawn and Vampirella take us on a journey to the bloody shores of Drakulon, post-apocalyptic New York, and worlds beyond imagination. Ultimately, they know that they must join forces to overcome him... but what common ground can be found between goddess and vampire? This deluxe hardcover features an all-new introduction and never-before-seen bonus material by Joseph Michael Linsner, as well as all six of the artist's breathtaking covers, plus an afterword by Kristina Deak-Linsner. Joseph Michael Linsner is most well-known for Dawn, his personal Pin-Up Goddess. After her debut appearance on the cover of Cry for Dawn #1 in 1989, Dawn struck a chord with thousands of fans on an international level. She is currently published in six languages and has come to life in the form of statues, action figures, t-shirts, lithographs, lunch boxes, and trading cards. An award-winning illustrator, Linsner has painted covers for all of the major comics characters, including Wolverine, the Justice League, Conan, and Vampirella. One of his proudest moments was getting to illustrate a short story written by Stan Lee for Actor Comics Presents. This deluxe hardcover features 144 pages of whimsical art and story by Joseph Michael Linsner, priced at $24.99, and on sale in finer comic shops and bookstores everywhere in June.